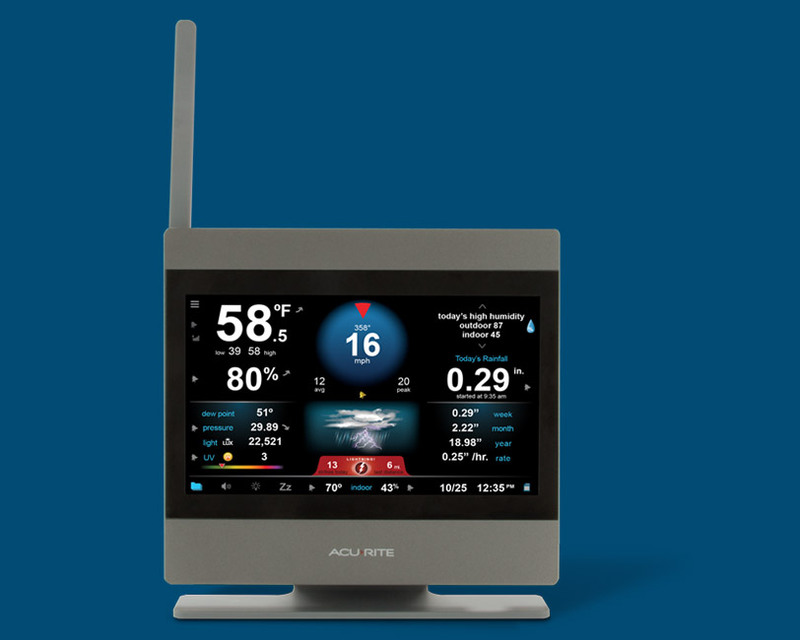 The future of weather monitoring. Unmatched accuracy with new features that track UV exposure, light intensity, lightning and more. Watch the short AcuRite Atlas Overview video. The new Atlas HD touchscreen display keeps you informed with easy to read weather conditions and archives historical data so you can always look back. The tools you need to better understand your environment. 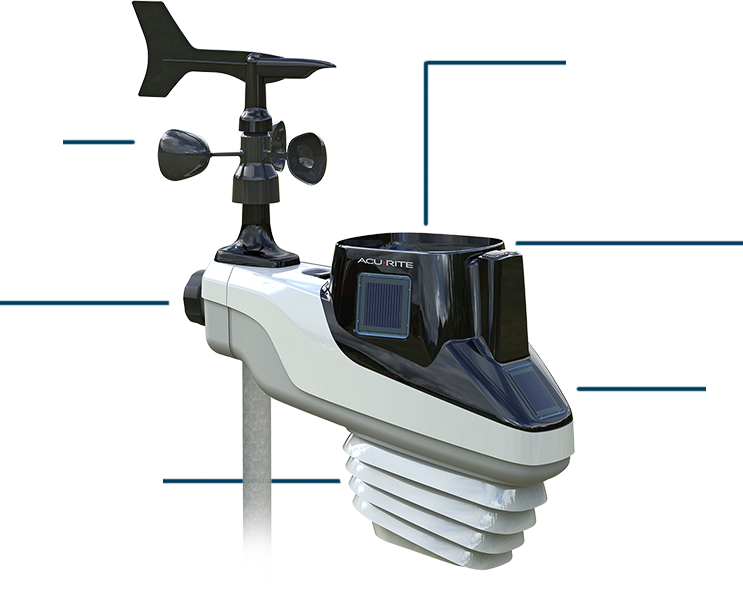 Reliably and accurately measures wind speed and direction, professionally tested to withstand up to 160 mph winds. Setup is simple and easy with a tool-free installation, using a mounting knob that can be tightened around most pole sizes. To give you highly precise temperature and humidity information even in direct sunlight, the innovative design and internal aspirating fan disperse radiant heat that can cause inaccurate readings. The rain gauge uses a wide collector to maximize measurement accuracy, and empties rainfall automatically. The UV Index and Light Intensity sensors detect sun exposure and light conditions in your actual location. "Most simple installation of any weather station yet! Take it out of the box, slip it on the pole, and tighten it down. All setup on my phone." is being able to share your data online with friends and family!" "Florida weather changes frequently from area to area, so I trust my AcuRite much more than the local weather." 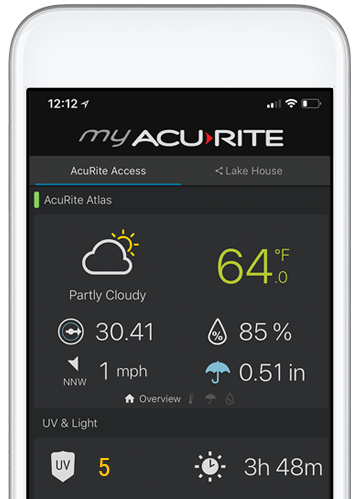 My AcuRite’s smartphone app, tablet and browser-based interface helps you stay connected to what matters most. View your environmental conditions from work, on vacation or from your favorite chair. Know your environment - inside and out. 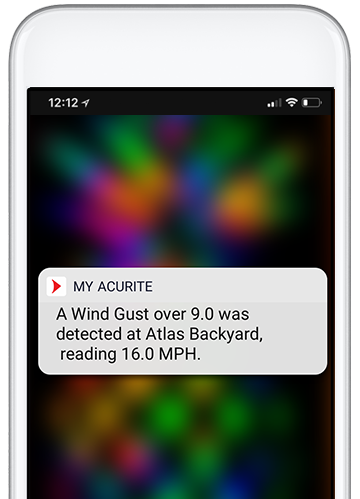 Quickly access your AcuRite Atlas sensor data from your mobile device. Receive an email or phone alert when environmental conditions change and need your attention. 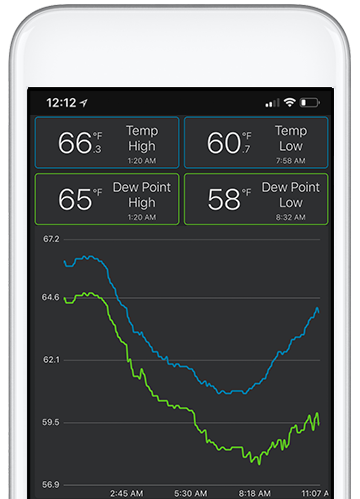 Chart, graph and analyze weather trends. Download data for serious number crunching. Get your Atlas up & running fast. Precisely measure your environmental conditions. Get all the latest updates on sales and offers. Sign up for AcuRite emails today and get 10% off sent to your inbox.